Morgan Williams, class of 2014 class speaker. President Rebecca Chopp, while referencing the sesquicentennial, devoted a portion of her remarks to a “gentle and giving” student who should have been among the gathering of 367 graduates in the Scott Amphitheater. 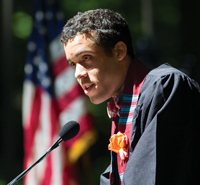 Chopp typified Ravi Thackurdeen as “a star that shone brightly in our midst.” The 2012 Richard Rubin Scholar who planned to major in chemistry, perished after being pulled out to sea while studying in Costa Rica in April 2012. Thirteen members of the Thackurdeen family, including Ravi’s brother, Sean ’12, attended the ceremony. The audience also heard from honorary-degree recipients scholar and writer Thomas Laqueur ’67; documentary photographer Barbara “Bobbie” Norfleet ’47, P’79; vocalist and composer Vaneese Thomas ’74; and U.S. Rep. Chris Van Hollen ’83, D-Md. Special awards went to Jonathan Molloy (Ivy) and Naudia Williams (Oak Leaf) for outstanding leadership, scholarship, and contributions to the College community; Sierra Eckert (Lang) for outstanding academic accomplishment; and Katie Samuelson (McCabe Engineering) for outstanding achievement in engineering. Watch highlights from the weekend at www.swarthmore.edu/commencement.